Our expertise allows us to offer a one-stop-shop for refurbishment projects, giving our clients the benefit of one point of contact. Our refurbishment service can transform any room creating ‘wow factor’ to inspire students and staff. At the same time we also consider the practical aspects of your layout, to leave you with a room which is intuitively easy to use and tailored to suit your budget. 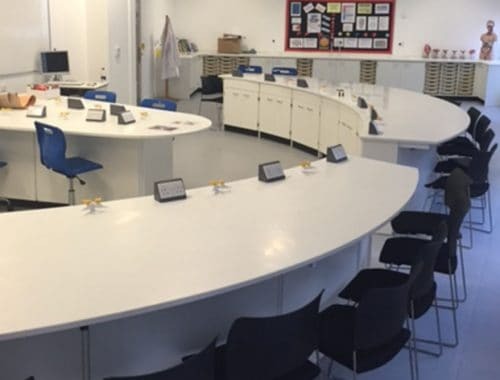 We are really proud of our wide range of case studies and testimonials and hope they will help illustrate how we could work with you on your school refurbishment project. Klick were chosen as they had worked at several schools in the area and had a proven track record. They also proved to be cost effective when compared to other competitors on a like for like basis. 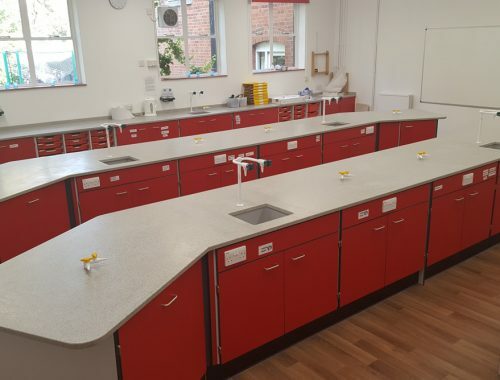 Their refurbishment has transformed a standard classroom into a bright, exciting and much needed additional lab. Their customer service was consistent from first visit to handover and we hope to work with them on other projects very soon! We have a friendly team to help guide you through the process. The four key members have over 80 years’ refurbishment experience between them. We start by discussing your requirements and budget in detail. At this stage we can provide a feasibility study if required. Unlike other companies we have a furniture design team and a project management team based in the same office which enables control of the process from initial concept ideas to the completed project handover. Managing all aspects of the project in this way reduces room downtime and makes our total packages very competitive. 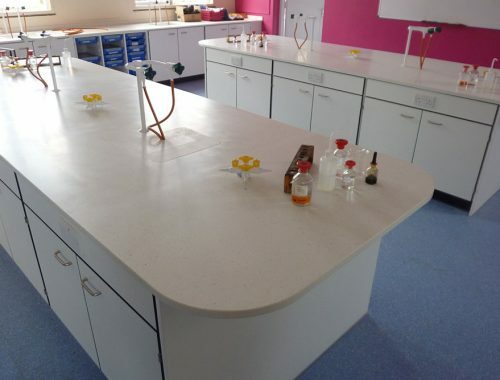 We can handle all aspects of design, installation and refurbishment for school science labs, food technology rooms, ICT Suites, technology and art rooms. We supply you with the furniture and everything from lighting to flooring – to suit your requirements and budget constraints. 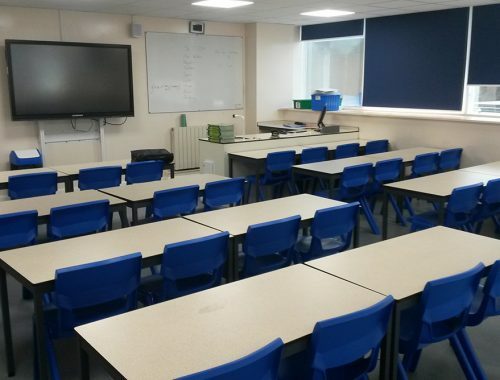 The quality of our school refurbishment projects is of paramount importance to all our employees. Our electrical engineers are NICEIC registered and our plumbers are Gas Safe registered. All our fitters are CSCS qualified. Our refurbishment team ensure compliance with all health and safety requirements in line with ‘The Construction (Design & Management) Regulations 2015’. The company is also CHAS and Constructionline accredited. On completion our site team will carry out a project handover and provide the relevant O&M documentation for your site manager. All Klick employees are DBS checked and comply with the DBS’s code of practice to protect children and vulnerable adults. 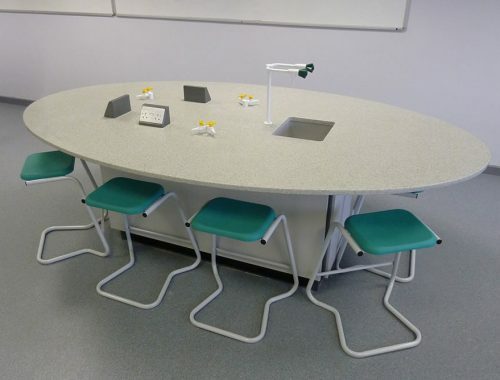 We specialise in science laboratory refurbishments and conversions. Our initial survey will assess your existing service locations and ensure there is sufficient power, gas and water pressure. 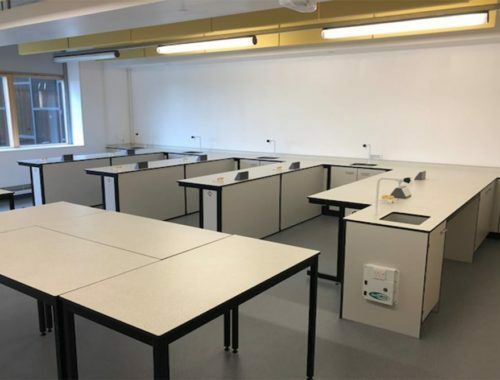 In order to create an inspirational new science laboratory our specialist team will make layout suggestions to maximise your space and budget, illustrating our ideas using CAD drawings. Once approved, we will then schedule the work at a time to suit you. 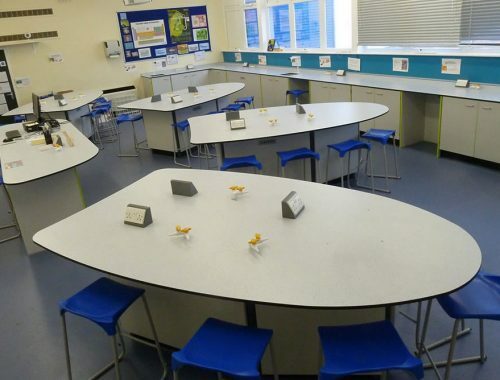 If your existing food technology facilities need updating we can transform them into a modern and stimulating environment. We can also convert other rooms into a food technology room and assist with a feasibility study to work out which rooms to convert for the minimum cost. Our designers can advise on the best way to accommodate all the different disciplines required and advise on practical considerations such as storage, extraction requirements and safe working distances. Hygiene is of paramount importance and we can offer advice on work top suitability and hand wash provision. We also work with selected suppliers for the supply of white goods, if required, as part of the project. 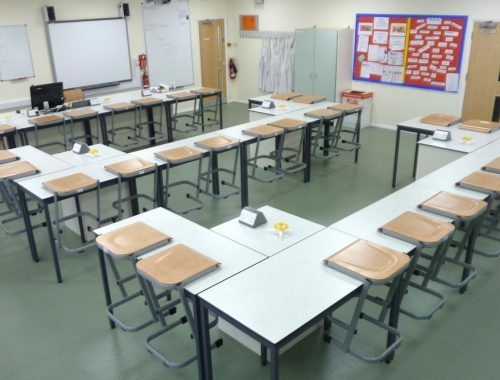 We are often asked to provide term time installations and we regularly refurbish schools when they are occupied. We manage all our projects sensitively, scheduling work with our clients to cause the minimum of disruption. We’re planning a refurbishment project. What can we do to get the process started? Discuss the project with your relevant staff, especially those who will be using the space on a daily basis, like technicians & subject teachers. Then make a wish list of priorities. You may want to create an inspirational space with ‘wow’ factor, increase storage provision, change the layout to improve the flow of the room or add a storage wall to help de-clutter. We also suggest visiting other schools to get inspiration and ask what works practically for them. How much does a refurbishment project cost? Take a look at our case studies which all detail project value to get a rough idea of a similar size of project. We always think it is best to be open about pricing up front and will happily quote a ball park price, if required, to get things started. To get an accurate estimate it’s best to take advantage of our free quotation service, which will include a price for the provision of gas, water & electrics which are not easy to estimate without a survey. What is the best way to control the costs of a refurbishment project? Before commencing work on a refurbishment project make sure you have a fully itemised quotation to include the full scope of works. Using one company to co-ordinate your project means you have a single point of contact and one price to include all sub-contractor elements. The current layout of our room is not practical. Can we reconfigure the space? Our refurbishment team can survey the space and make practical suggestions which will depend on the structure of the existing building. Is it possible for Klick to make minor structural changes to make better use of our available space? Yes. By relocating a doorway to change the access, moving a window or moving internal walls it might mean you could achieve a more impressive/practical layout. Our staff would like advice on the optimal design for our space. Can we see visualisations to show alternative layouts? Yes. Our designers can discuss your requirements and then provide CAD visualisations to show different options. How can I maximise my budget? Our designers can make suggestions and work to a restricted budget. 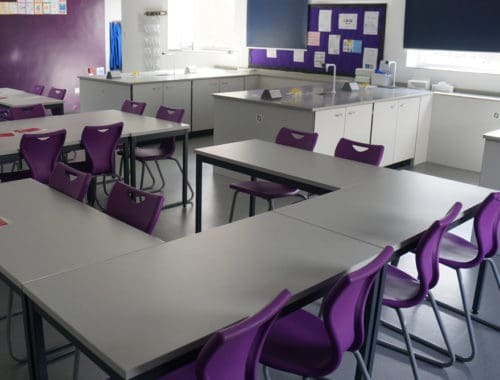 For school refurbishments we have extensive experience of managing term time projects which we offer at a significant discount. Our work can be scheduled around the school’s timetable. Heavy disruptive work can be restricted to after school hours and separate zones can be established to segregate contractor working areas. How do we decide on the most appropriate materials for the project? Discuss your plans for any new rooms with teaching staff and technicians. 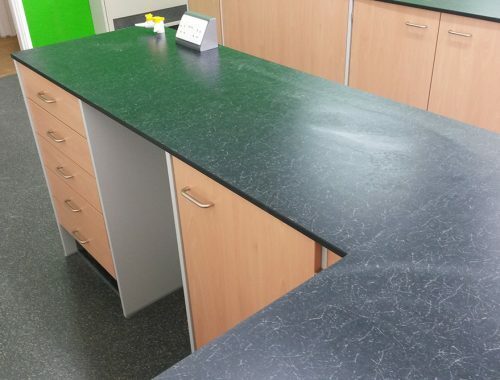 There are many options/colours available for worktop finishes, flooring and walls. Then discuss your brief with our designers and they can offer advice on the most practical solutions for you. What safeguarding credentials are required? Klick ensure all our operatives are DBS checked to ensure safeguarding guidelines are adhered to. How can we future proof our investment? Select a supplier you trust and ask lots of questions to ensure your refurbishment investment is worthwhile. Get advice on the best materials/equipment that will be relevant for the end use and that will stand the test of time. Klick advise where possible to budget for service ducts in the floor. This allows for any additional future cabling to accommodate changes in IT requirements. We generally advise on a neutral palette for fitted furniture. Brighter highlight colours can be introduced via feature walls or accessories, such as stools or trays, which are easier and cheaper to update. This will give your room more timeless appeal. Our designers have years’ of experience and will be happy to advise on other ways to make the most of your investment. 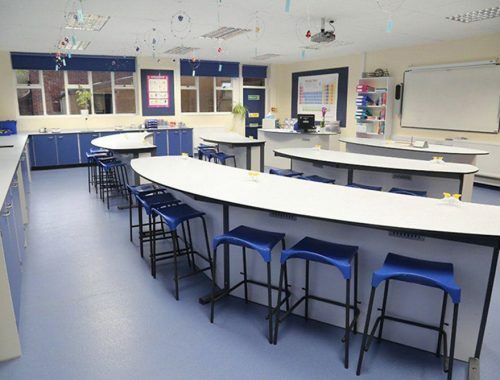 Call us now to discuss your school refurbishment project. Browse our latest Refurbishment Case Studies using the arrows below or click to view all case studies.